The Acol bridge bidding system is named after a road in Hampstead, London, where there was a bridge club in which the system started to evolve in the 1930s. According to Terence Reese, its main devisers were Maurice Harrison-Gray, Jack Marx and S. J. Simon. Jack Marx , writing in the Contract Bridge Journal in December, 1952, said: "...the Acol system was pieced together by Skid Simon and myself the best part of 20 years ago." The book "The Acol System Of Contract Bridge. " is the first book on the system and was written by Ben Cohen and Terence Reese. Skid Simon explained the principles that lay behind the system, and the system was further popularised in Britain by Iain Macleod. The Acol system is continually evolving but the underlying principle is to keep the bidding as natural as possible. It is common in the British Commonwealth but rarely played in America. Or buy from Amazon.co.uk. "Bridge with Brunner - ACOL Bidding for Improvers " by Michelle Brunner is Michelle's first book. It is a comprehensive book on Acol bidding aimed at the beginner to improving player. "Bridge with Brunner - ACOL Bidding for Budding Experts" by Michelle Brunner is a nicely laid out book on the ACOL system, designed for the students who have some basic knowledge of the game. It covers all the opening bids and responses, slam bidding, competitive bidding, and intervention by opponents. The contested auction has always been sadly neglected in bridge books. Reputable writers who deal quite thoroughly with, for example, the choice of opening bid when one has two four card suits tend to push the whole question of competitive bidding very much to the background; often adding a skimpy chapter or two in the closing pages of their books. In many ways, of course, this is quite logical, for bidding almost always becomes much more difficult when both sides are in the auction, and partnerships who are ill-equiped to compete when the opponents intervene, have little chance of making real progress at the game. In this innovative book "Acol Index", Eric crowhurst develops and extends the unique index of bidding sequences which first appeared in his classic 'Precision Bidding in Acol' some 30-odd years ago. The meanings of all of the sequences of up to four bids which are likely to occur in an uncontested auction are discussed and analysed. Crowhurst guides the reader through the all-too-common minefields of misunderstanding in a readable manner. He caters for those players who are content to play traditional Acol as well as those who have grafted on such attractive options as baron 2NT, Major Suit Swiss, Minor Suit Swiss, Herbert Negatives, Multi Two Diamonds, Puppet Stayman, Roman Keycard Blackwood, Splinter Bids, South African Texas Transfers, Benjamin Two Bids, Jacoby Transfers over 1NT and 2NT, Weak Twos, Fourth Suit Forcing ... and the Crowhurst convention. "Acol Index" is a definite textbook, enabling regular partnerships to ensure that their Acol bidding is on the same wavelength. It will prove invaluable in solving disagreements as to the the meaning of any particular bidding sequence. The book is a reference book and is not the sort of book you want for a casual read. "Understanding ACOL" by Eric Crowhurst and Andrew Kambites covers the uncontested auction and competitive bidding with all the basic concepts. A few modern conventions are included as appendices. Aimed at the club player who wants to consolidate their ACOL bidding. Enlarged and revised for this new (1997) edition, this guide includes information on takeout doubles, deals with the "Law of Total Tricks," and provides a new structure for no-trump rebids. It is designed to help all Acol players and their partners improve their bidding skills. "How I Became a Life Master Playing the Weak NoTrump" by Eric von der Luft is a thorough guide to incorporating the weak NoTrump opening into a Standard American bidding structure. Chapters include how your suit openings are effected; the merits of each NoTrump range; responses to the weak NoTrump; and responses at the 2-level. (1) A greater proportion of limit bids and a higher frequency of bids in general, improving communication between partners. (2) More accurate low-level descriptive bids, making it easier during the auction to envision the probable play of the hand and to find your best contract. (3) Increased use of preempts, making it more difficult for the opponents to find their best possible result in a competitive auction. "Kaplan and Sheinwold ... might well turn in their graves over Luft's aggressive stance." --The Bridge World. A definite work on negative doubles for all serious Acol players. In "Negative Doubles for Acol Players" Marty Bergen, together with Tim Bourke, cover the hands that are ideal for a negative double, those which are imperfect but still qualify, and those with which you simply must not double. The majority of bridge players worldwide play the strong No Trump, but there is a sizeable minority that play the weak variety (12-14). In his book "The Weak No Trump - How to Play It, How to Play Against It" Andy Stark discusses the advantages and disadvantages of either opening and shows how the 1NT range impacts the rest of the bidding system. "The Weak Notrump" by George Coffin. The weak No Trump is an integral part of the Acol bidding system. This book explains both how to use it and how to defend against it. "Improve Your Acol Bidding by Understanding its Logical Basis" by Andrew Kambites and Pat Husband is another book in the EBU Task Master's series. "Understanding the Uncontested Auction" by Ron Klinger and Andrew Kambites is based on Acol - 4 card majors and weak notrump. The book helps the reader to understand the basic principles of bidding rather than just memorising bids and sequences. It can be used as a complete modern bidding system. "Understanding the Contested Auction" by Ron Klinger and Andrew Kambites again assumes an Acol based system. It shows you how to understand the principles that will guide you the maze of competitive bidding, and demonstrates how you can inconvenience your opponents should you hold the balance of power. Acol bidding is the most popular system in the UK and is used by the majority of players throughout the country. Because it uses a weak no-trump opening and a minimum of conventions, it's a great way for beginners to learn how to bid with confidence. Partnerships that use Acol will never have misunderstandings in the auction, regardless of the level of experience of either or both players. Now, thanks to the Daily Telegraph book "Easy Guide to Acol" by Patrick Jourdain, all bridge enthusiasts will get the perfect introduction to this logical, easy-to-understand method, ideal for newcomers to the game as well as all social players. The classic "25 Bridge Conventions You Should Know " (buy from Amazon.co.uk ) by Barbara Seargam and Marc Smith has sold over 60,000 copies in four different languages - which makes it the best-selling bridge book of the last 50 years. "25 Bridge Conventions for Acol Players", by Sandra Landy, Mark Horton & Barbara Seagram, is a new book which uses the same user-friendly approach and features to explain the most important bidding conventions for players using the ACOL system - which means the majority of bridge players in the UK. "Guide to Better Acol Bridge" by Ron Klinger first appeared over 20 years ago. Although the fundamentals have not changed, there has been progress in the approach to Acol bidding. This new edition retains the basic structure while introducing many new concepts. While the emphasis is on better bidding, each chapter contains examples of play. These incorporate the bidding principles of the chapter and also highlight many areas of winning declarer technique and defence. The book can be used by teachers conducting intermediate courses or as a self-teacher. Each chapter contains plentiful exercises and partnership bidding practice. At the end of each section, a revision test enables the reader to measure the rate of progress. 'This is a book which is absolutely packed with good material - and when we say packed, we mean packed for not a scrap of space is wasted.' - Bridge Magazine. "Tips for Better Bridge" by Bernard (Mr Bridge) Magee gives short and simple tips that help you to improve your Acol bidding and play quickly and easily. "Acol Bridge Made Easy" by Ron Klinger will have you playing bridge and bidding the Acol system in just a few short hours. "Step-By-Step Constructive Bidding" by Tony Sowter is a good coverage of the uncontested auctions in a natural 4-card major system, concentrating on the areas of which the average player experiences most difficulty. "Step-By-Step Competitive Bidding" by Tony Sowter systematically deals with the takeout double and responses, overcalls and responses, balancing, pre-emption, competitive and responsive doubles, competing after INT and defending against special openings. To combat intervention Tony explains the negative double, raising partner in competition and re-opening. "The Right Way to Play Bridge" by Paul Mendelson is a complete reference to successful Acol bidding and the key principles of play. For improving players. "Opening Leads for Acol Players" by Mike Lawrence and Ron Klinger is an adaptation of Mike's "Opening Leads" book that takes an acol auction into account. "Power Acol" by Ron Klinger does not tamper with the basic bidding structure of the Acol system, but aims instead to provide an improvement on standard responding and rebidding methods. Information is supplied for both partners, making it easier for players to judge the best contract. "Acol Bridge Flipper" by Ron Klinger is one of the top-selling bridge books of all time with sales already over 160,000 copies. This new, updated edition of the famous fast fact finder will be a must for all Acol bridge players. With a unique format it enables players to check rapidly important points in bidding and play. Acol Bridge Flipper is aimed at the vast number of people who already play and who want to improve. "Tournament ACOL" by David Bird and Tim Bourke is a lucid account of modern ACOL methods, incorporating the latest "Total Tricks" ideas, the losing trick count, third suit forcing (the Bourke Relay), and many other new ideas that will make your ACOL more suited to today's conditions. "Acol Bridge for Bright Beginners" by Hugh Kelsey and Andrew Kambites gives you a brief introduction of how the game is played and the equipment you need, followed by clearly-explained chapters on bidding and the play of the cards. Each chapter is backed up by carefully designed quizzes so that you can test your progress and reinforce what you have learned. "Acol Bridge for Bright Improvers", Hugh Kelsey and Andrew Kambites,by is the follow-up book. In "Bridge: Light Up Your Understanding of Bidding" William J. August puts the basics of bridge into a logical progression of concepts and guidelines. One of his primary goals is to have the reader understand why he bids the way he does. He is not satisfied to say that you should have 13 points to open the bidding - he tells you why. He is not satisfied to say you should bid up the line - he tells you why. The book covers all the basic ground in a 4-card major system - opening bids, responses, rebids, notrump bidding including Stayman and Jacoby transfers, overcalls, takeout doubles and even some more advanced concepts such as balancing. Paul Wokes is a resident of Lincolnshire in the UK. His lifelong passion has been Bridge, both playing and teaching the game. He and his partner, Dave Pettengell, have won virtually every tournament in the County and have represented Lincolnshire in National competitions. 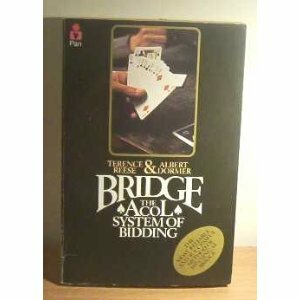 "Anyone for Bridge" provides a clear, concise reference of the key elements of the Acol bidding system. It also contains detailed instructions on how to improve your card play. The book is designed for players of all ages and abilities and explains key terms and techniques using many examples with clear, straightforward explanations. It is a useful tool that will enable readers to improve their game and lead to a more enjoyable and enriching experience of Bridge. "Don't be a Dummy at Bridge" by Derek Gittins is a guided tour through basic Acol for social or other players wishing to iron out some of the wrinkles in their game. "Acol in the 90's" by Terence Reese and David Bird is a well-presented, clearly written, complete account of the modern Acol bidding. "The Acol System of Bidding" by Terence Reese and Albert Dormer. Written by two top level tournament players and packed with examples and practical explanations, this is a great guide to making the ACOL system give a new winning streak to your game. "Acol-ite's quiz: Including the basic rules of the Acol system, quiz exercises and competition quizzes" by Rhoda Barrow Lederer presents easily grasped instruction on the Acol bidding system. Six sections cover different aspects of bridge, each with a summary of the relevant rules. "Strategic Acol Bidding" by Andrew Kambites is part of the Task Masters series published in collaboration with the English Bridge Teachers' Association shows how to make the corrrect choices when close bidding decisions have to be made. It contains exercises that are useful for testing the student's knowledge of the game. "Bridge is an Easy Game" by Ian Macleod is a classic; half on Acol (which he helped invent before becoming a politician), half on play. The sequel "Bridge Is Still an Easy Game " co-authored by Peter Donovan (buy from Amazon.co.uk ) introduces some more modern theory. "Improve Your Bridge" by Amanda Hawthorne and Mark Horton is intended for the more advanced student of the game of bridge who is keen to expand his knowledge of all aspects of bidding, declarer play and defence. This guide gives an accurate presentation of the Acol bidding system and for that reason is popular with teachers in the UK. The original Pocket Guide to Bridge has sold more than 30,000 copies since it was published in 2002. This 2009 version by Mark Horton and Barbara Seagram is based on the Acol bidding system for readers in the UK and other places where Acol is popular. "Overcalling in Acol " by Pat Husband and Andrew Kambites. This book is part of a series published in collaboration with the English Bridge Union Teacher's Association, and takes the player on from the basic bidding and responses to the subtly different requirements of overcalling during the auction. Or buy from Amazon.co.uk . Acol quiz: by Ben Cohen. A collection of bidding problems based on the Acol system of contract bridge. Or buy from Amazon.co.uk . For Acol books for beginners, see beginners books page B6.